Your neighbors will be only slightly weirded out. Anyone who has ever gone from an intense workout into the welcome warmth of hot, wood-scented sauna knows just how great the feeling is. As you sit back and warm up, you can practically feel your blood vessels expand and your muscles relax. If you've ever wished you could do that after a run or an intense bodyweight session at home, Almost Heaven has you covered with the Grandview. 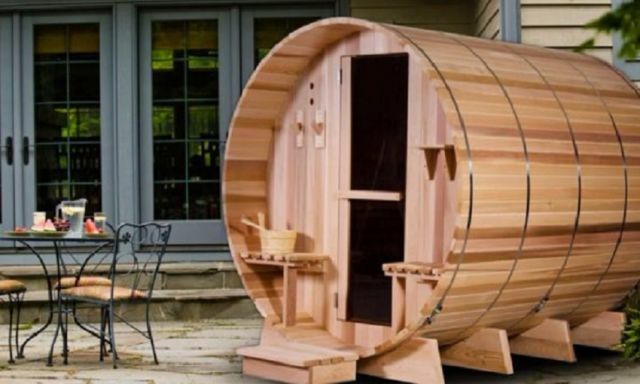 It's a 12-foot wooden barrel, available in three kinds of wood—Nordic Spruce, Hemlock Fir, and best of all, Red Cedar—and easily assembled over a weekend with some beer, a friend, and the right tools. There are no metallic parts (staves, etc.) inside the barrel to brand the unwary and it can seat up to eight. The price point for this ideal backyard getaway is striking—the base model is $8299—and for just $200 more you can add a canopy.